Cupcakes 'n Daisies: Tickled Red . . . .
adorable with a capital A!!!! just love it, looks great on your table. What a beautiful table topper! The reds are all so lovely together. And extra special because it's made with your Thelma bundle! This is gorgeous! Love how you made this with your bundle and have so much left over. I ordered your Thelma bundle after I read about it and it arrived yesterday...it is such a yummy bundle, I could eat it! Fabulous, and the flange is just perfect between the borders. Very pretty. What a wonderful table topper for February and July too as well as Christmas. I see a lot of uses for it. It would also look gorgeous in the livingroom near your red couch. Cute, cute...love those reds! I'm going to order a Thelma bundle. I am squealing with delight!!! That one I would surely be a copy cat on!! LOL!!! You have another week to get it all quilted up and still be on the table for February!! I've always liked piano key borders, but never liked how people made them go the ends - I like the corner squares you did. Oh heck, I like the whole thing! Those little red stars just sparkle!! Perfect!! This is absolutely wonderful! What a perfect quilt to make with your perfect fabric bundle!! So cute, love the "peeper!" It is these little touches that make a quilt truly special, and your own! Super cute. Those bundles are going to fly out of FQS now! Oh my, that is so cute!! What a great use of your bundle! Love your table topper. And it's especially lovely using your very own bundle! This is Totally Thelma! I love how you used your own bundle to make it. It turned out really cute....I love the border too! Oh my gosh.... SO PRETTY! So cute... love the peeper! My Thelma bundle should arrive next week... I have plans for it, but after seeing Tickled Red, I might have to change 'em! Adorable! That "peeper flange" is the perfect touch! Very cute! Love how the lighter reds make the stars sparkle and the backgrounds are perfect! This turned out so well! Love the pieced border. Looks great on your table! Your TICKLED RED is some pretty! This turned out so cute! All the reds work very well together. I like stars instead of hearts for February! I can't believe that you used all but that much of your fabric bundle! 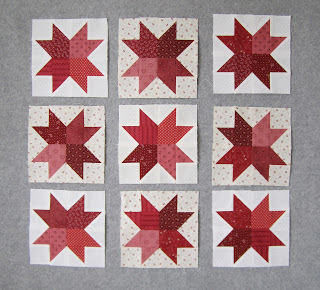 I think your quilt is very pretty... but I really like your choice for the cornerstones... it makes it just perfect! 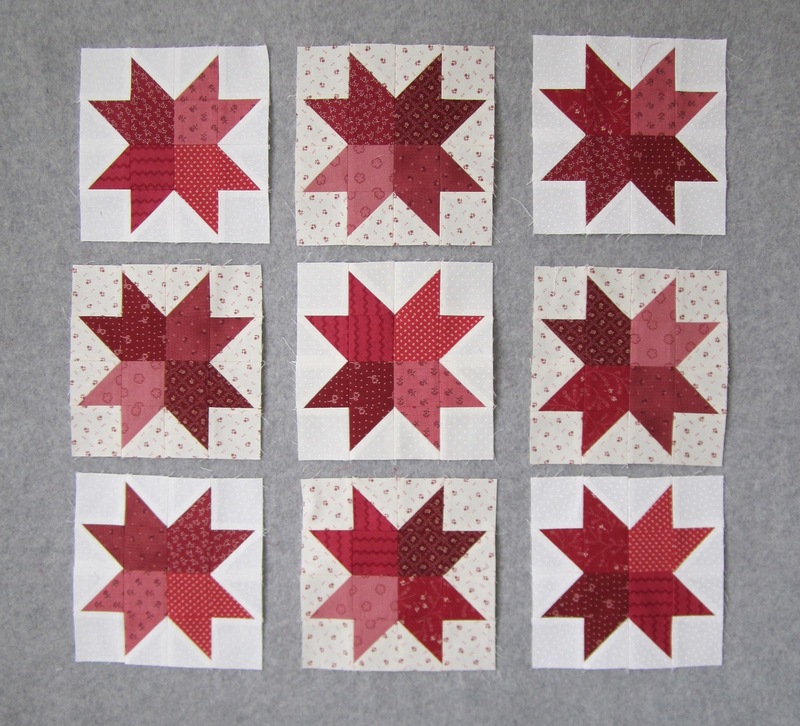 LOVE LOVE LOVE your RED STAR quilt Thelma! It's darling!! The Thelma bundle RED STAR gets a GOLD STAR award from me!! I am blown away by how quickly you put this altoghether and it is STUNNING! Tickled Red is fantastic, Thelma. So bright and happy. Love it. Well Thelma, you've done it again. Gorgeous! Love it. Love it and your bundle! It looks lovely! And bonus, leftovers. I love leftovers, particularly when they are some favourite fabrics.